Winter 2015-2016 is warmest on record in U.S.
Winter in the northern hemisphere is not quite over (the spring equinox is March 20), but it is already clear that, at least in the continental United States, there hasn’t been a winter like it since at least 1894. The National Oceanic & Atmospheric Administration said Tuesday that the average temperature this season throughout the contiguous 48 states was 4.6 degrees Fahrenheit above average. The mean temperature on the mainland U.S. was 36.8 degrees Fahrenheit between December and February. The previous record high winter temperature was set during 1999-2000. Warmer tropical Pacific waters release more heat to the atmosphere, causing more rising air and storminess in the central and eastern tropics. The rising air moves north (and south) away from the tropics, traveling to the mid-latitudes, where it shifts the North Pacific jet stream farther southward and eastward. Movement and extension of the jet stream can bring more storms to the United States, and change the seasonal temperature and precipitation patterns. This graphic shows typical ENSO warm episode impacts. Note that those impacts are not uniform throughout the world. Some areas can be warmer or cooler than others during this type of event. 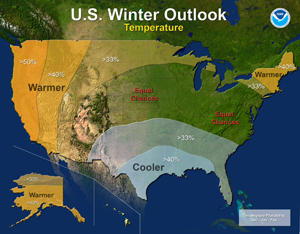 Graphic courtesy NOAA. 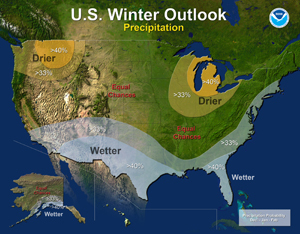 In fact, winter has been wet in North America this year. NOAA reported that, during the December-February period, the continental U.S. received the twelfth-most amount of precipitation for that time interval in recorded history. The name El Niño (referring to the Christ child) was originally given by Peruvian fisherman to a warm current that appeared each year around Christmas. What we now call El Niño seemed to them like a stronger event of the same type, and the usage of the term changed to refer only to the irregular strong events. It wasn’t until the 1960s that it was widely realized that this was not just a local Peruvian occurrence, but was associated with changes over the entire tropical Pacific and beyond. The opposite of El Niño is La Niña, which is marked by water temperatures in the eastern Pacific Ocean and near the equator that are below average. Measurement of the extent to which ongoing anthropogenic climate change has driven the high temperatures experienced in the U.S. this winter is difficult. However, it is clear that ocean water temperatures are rising as greenhouse gases continue to be emitted to the atmosphere. This happens because, as the temperature of the air in Earth’s lower atmosphere rises, the oceans absorb some of the heat. The oceans are now warmer than they have been in at least 50 years. The surface of the world’s oceans has become warmer overall since 1880. In this graph, the shaded band shows the likely temperature range, which depends on the number of measurements and the methods used at different times. Source: U.S. Environmental Protection Agency, Climate Change Indicators (2014). Graphic courtesy U.S. Environmental Protection Agency. The rising temperature of the oceans does likely cause warmer winter temperatures in at least some areas of the globe. When liquid water is heated, the molecules of the compound evaporate into a gas called water vapor. The process of evaporation adds heat to the surrounding atmosphere.